A songwriter and musician from the borough is preparing to take metal fans on an introspective journey into the mind with his band’s new album. Carl Eden, who is originally from Golborne and the keyboardist for symphonic metallers Dead of Night, is preparing to unveil the group’s third full-length release The Evolving Science of Self. 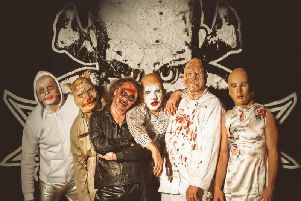 Carl started the band as an outlet for his writing, with his creative vision now being brought to life by singer Briony Featon, guitarist Dan Roberts, bassist Jason Peacock and drummer Mark Commons. The new album represents of a departure from Dead of Night’s usual composition process and Carl is also keen to distance his group’s music from the theatrical metal acts it is often lumped in with. He said: “Normally I come up with the title and write all the songs around it but this time I wrote all the songs and then looked for a name. “I started looking back through the lyrics and it was clear this album was quite introspective. I was looking at ideas about the soul and spiritual things. This is about trying to understand our own motivations. “There’s a track called One For The Moon where Dan came up with a really storming guitar riff we just had to use. “Our record company pushes us as symphonic metal but that gets us compared to Nightwish and I don’t think we’re like them at all. “This album is quite heavy with lots of Dan’s guitar riffs and some sections are quite thrashy but it’s also quite melodic too and there are prog elements. Carl founded Dead of Night in 2012 after previously spending years in covers bands and combines the group with working as a private piano teacher. The band is planning a calendar of live gigs for 2018, with dates already confirmed at Wakefield rock venue The Snooty Fox and a headlining slot at a Morecambe steampunk festival.